Marketing your Purcellville Home for Sale may feel like an overwhelming task, but just a few simple modifications to the exterior of your home can dramatically impact a buyers first impression and these savvy tips don’t break the bank! 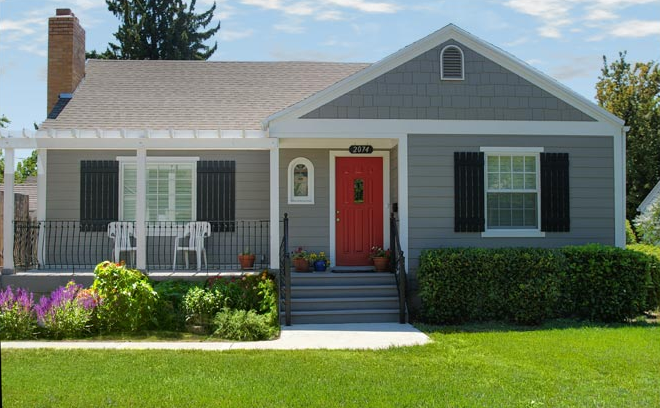 Your front door is the gateway to your home, and a fresh coat of paint is both cost-effective and goes a long way to freshening up the appearance of your home. Choose a complimentary color that coordinates well with the exterior of your home, or go with something fresh and fun. Update light fixtures and door knobs with coordinating accent fixtures that compliment the style of your home. What’s currently trending may seem out of place if the style of your home is English Cottage and you select brushed steel fixtures. Cut and edge your lawn and freshen up those flower beds! Remove weeds and debris from the long winter, freshen up the mulch and plant bright spring flowers that will give your yard the “pop” that could make a difference to a potential buyer. Thoroughly inspect the exterior of your home, your drive way and your porch and where needed, grab a scrub brush and a gentle, earth-friendly detergent to remove mildew and dirt where needed. Rinse with a hose. Consider resealing your blacktop driveway. You will get tons of visual return on investment and perceived value for this one! Tuck away unnecessary items and stage the front porch to be inviting as space permits with comfortable chairs, a small table, etc. Clean the windows, inside and out. Windex will do on the interior. On the outside, use a little vinegar and dish soap in a bucket of warm water along with a sponge to cut grime and literally make your windows sparkle. Rinse with a hose. Finally, trim trees and bushes. Remove small voluntary limbs from tree trunks and tidy up shrubs. If necessary, call in a professional for larger limbs. Better to be safe than sorry! Need a referral to a professional? Contact your Real Estate Agent- typically, active agents have relationships with reputable businesses and can put you in touch with one or more professionals that provide great work at reasonable prices. Putting a little extra effort into the care of your yard and exterior of your home helps get your home sold quickly and for top dollar. Want to know more about how we sell homes in under 14 days on average? Email Me or give me a call on my cell 703-282-3085.